NEW YORK CITY—In a masterful demonstration of control and poise, a man in a suit on a train platform was seen Tuesday manipulating a copy of The New York Times as skillfully as if it were his job. “He was whipping, snapping, creating these perfect creases, and it was all so fluid and beautiful, like some kind of martial art,” said bystander Lisa Giles, 34, noting that sections of the publication emerged and retreated from the suited man’s adroit grasp with the unfailing precision and speed of a magician’s legerdemain. “When the train arrived, he did this breathtaking double-armed flourish, snapped the paper under his arm, and stepped aboard. Then he did the whole thing all over again—this time while keeping one hand on a pole at all times. 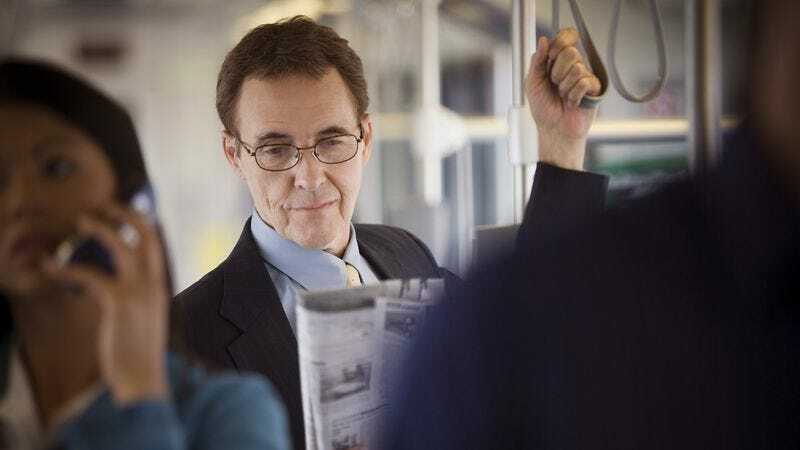 And he stood perfectly balanced, never once bumping into anyone or taking his eyes from the page as the train jerked forward or came to a sudden stop.” Witnesses agreed they had not seen newspaper handling of so high a caliber since the late-1980s golden age of newspapermanship.